First up is the teaser for the final 'Twilight' film Twilight: Breaking Dawn Part 2.' The astonishing conclusion to the series that illuminates the secrets and mysteries of this spellbinding romantic epic that has entranced millions. 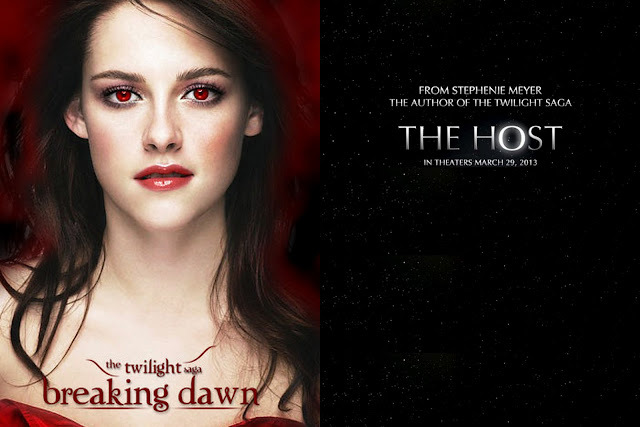 The film opens November 16 2012, the Bill Condon-directed final installment in "The Twilight Saga" stars Kristen Stewart, Robert Pattinson, Taylor Lautner, Peter Facinelli, Ashley Greene, Kellan Lutz, Jackson Rathbone, Elizabeth Reaser, Nikki Reed, Billy Burke, Rami Malek, Maggie Grace, Mackenzie Foy, Tracey Heggins, Judi Shekoni, Omar Metwally, Andrea Gabriel, Rami Malek, Angela Sarafyan, Marlane Barnes, Lisa Howard, Patrick Brennan, Noel Fisher, Guri Weinberg, Lee Pace, Toni Trucks, Bill Tangradi, Erik Odom, Valorie Curry, Joe Anderson, Olga Fonda, Janelle Froehlich, Masami Kosaka, Sebastiao Lemos, Amadou Ly, Ty Olsson, Wendell Pierce and Carolina Virguez. Second up is 'The Host' directed by Andrew Niccol and starring Saoirse Ronan, Max Irons, Jake Abel, Diane Kruger, William Hurt, Frances Fisher. Based on the best-selling novel by "Twilight Saga" author Stephenie Meyer, "The Host" is a riveting story about the survival of love and the human spirit in a time of war. Our world has been invaded by an unseen enemy. Humans become hosts for these invaders, their minds taken over while their bodies remain intact. Most of humanity has succumbed. 'The Host' opens March 29, 2013.